There is a good deal of quacking about looking and walking like ducks these days. So why not cluck instead, if only for some relief. During the past several week, I have been looking closely at opportunities within this decrepit excuse for a stock market. That has lead towards a simple thesis: There is clearly a shift in mentality towards commodities and pressure is building towards another bubbling. That lead to the next obvious question: How to profit? One particular food commodity has seen a significant move recently: CORN. The same corn that is used for production of ethanol and the same corn that is used to feed chickens. There is a clear inverse relationship that has emerged between corn pricing and the share prices of some of the poultry producers. Sanderson Farms (SAFM) is the one from this sector that seems to have an opportunity to move higher, once the realization that corn prices have a built-in ceiling. That ceiling is created by the need for corn prices to stay within reasonable limits in order to appease the ethanol producers and to maintain reasonable poultry prices. Sure, I know what you are thinking….Our government and the oil giants (one and the same actually) could give a damn and don’t care if ethanol is priced out of the market. But, in truth, they want to keep the appearance of an alternative fuel for the future, just as much as many of us wish to have an alternative. Beyond the basic premise that corn prices affect the share price of SAFM, there is the fact that SAFM is showing a substantial increase in production and have returned from almost complete devastation after Hurricane Katrina. The plants are producing and demand is high on a global scale. Additionally, there is talk of a North Carolina plant that could increase production capacity. Even if there is significant “food” inflation, the recent increase in corn prices is not sustainable. Cristoph Berg, a managing director at the German-based commodities research firm F.O. Licht., has stated that, “If corn prices are beyond a certain threshold, many [ethanol] plants will just stop producing.” That will cause a drop in demand for corn which would send prices down. 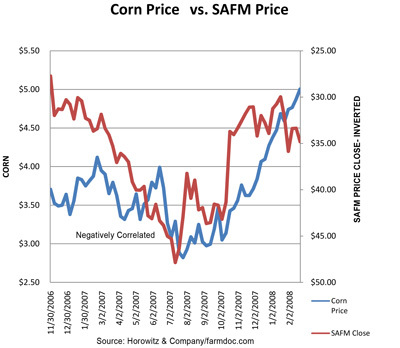 As the above chart shows, there is a very close relationship to the price of SAFM shares and corn prices. On the other hand, there is talk about a “dry” year and reduced corn fields that could have corn prices staying at these high levels and potentially increasing. That would create problems and it would appear that a pass through of some of the costs would mute sales. Even so, exports will continue to flourish as the dollar is weak and the world is hungry. The price points? Fundamentally, the company is sound. Market psychology is a much different story. Even so, buy below $37, protect with a stop near $31 and look for $45 if the markets show any signs of upward movement. From Barron’s weekly: (Michael Santoli)IN SCARY TIMES, WHY NOT HUDDLE with other chickens? For investors, this means giving a look to (SAFM) a major chicken producer with an undervalued stock, which could be among the next wave of beneficiaries of the “agflation” craze. Sanderson, a $700 million market-capitalization company out of Laurel, Miss., had a couple of tough years after Hurricane Katrina and the bird-flu scare. But as the low-cost producer, Sanderson has benefited nicely from strong chicken prices and its recent addition of production capacity to produce $3.88 a share in earnings in the fiscal year ended last October. Now, the Street is looking for an unchallenging $2.33 in earnings for fiscal 2008. Sanderson shares, now at 34.86, were around 32 a year ago, ran up to the mid-40s and then came tumbling back down. Twice recently, the stock has approached 30 and found eager buyers. Even using the consensus forecast, Sanderson at 14 times earnings is a good deal cheaper than peers (TSN) (PPC). But the juicier bet on Sanderson is that the numbers are too low for 2008. The main knock on Sanderson is that chickens eat corn, and corn prices are setting new highs. This seems the basis for the large short position in Sanderson — a full 20% of its float, or nearly seven days’ average share volume. Yet investment advisor Andrew Horowitz, author of the recent book The Disciplined Investor , notes that over time Sanderson shares and corn prices have been positively correlated, indicating an ability to pass through feed costs. Given that chicken is a cheaper protein to begin with, Sanderson should have some headroom on pricing. Merrill Lynch economists note that poultry prices have risen 8.3% at retail. This all suggests that the poultry cycle has some distance to run before the next peak. At the top of the last cycle in 2004, Sanderson, with less production capacity, earned $4.58 and the stock hit 55. So a run back into the 40s hardly seems a stretch. Disclosure: Horowitz & Company clients hold positions LONG as of the publish date.